Burnley FC Ladies ended their season in style with a 3-1 win against a physical but skillful MSB Woolton side at Barden. The Lady Clarets achieved their highest points total in the North West Women’s Football League in the process, and currently sit in second place, though Wigan Athletic can reclaim the runners-up position if they win their final game. The Liverpool outfit made a spirited start and were first to press at goal but a long-range strike ran wide. The Clarets soon started to compose themselves, and captain Jo Holt was on the offensive, but her long range shot was easily collected by the keeper. Justine Wallace collected the goalkeeper’s clearance close to halfway and played through Joanna Rohman, setting Linny Craig off on a left-wing charge. She crossed from the bye-line, and Georgia Payton cleverly skipped away from her marker to collect the ball at the far post and finish in true Payton style to open the scoring. The Lady Clarets maintained the pressure and were unlucky when Sarah Greenhalgh ran in and leapt high to intercept a Craig corner, but her header smashed against the bar. Holt struck a volley which was blocked by a defender on the line, and the ball was scrambled clear. The Clarets dominated much of the next period and had many half chances, but at the other end MSB Woolton mounted a couple of high-speed attacks through their star player Katie Thomas. In one such move, three Claret shirts converged to intercept her and she was awarded a free kick on the edge of the area. The kick was angled wide of the defensive wall and was blocked by Clarets keeper Leanne Ashton-Smith, but the ball fell loose and was scrambled over the line. In the final 15 minutes of the half, both teams battled hard, with strong challenges from both sides, and the game developed a tempestuous element. In the second period, the Lady Clarets come out with determination and played with flair. They were met by strong defence, but initially controlled the game. As the heat died dow,n Woolton too began to play better football and started to challenge the Clarets goal. As the game opened up, the Clarets were able to play into space and find ways through on goal. Wallace picked out Craig, who dribbled through the box before striking narrowly wide. At the Clarets end, Woolton created havoc in the box from a free kick, but the ball was cleared. In the last 15 minutes, a draw seemed likely. From a corner, Kim Sykes received the ball and shot just wide. The goal kick was intercepted by Greenhalgh and played forward to Wallace, who again lofted a ball to Craig, and this time she slotted the ball just inside the far post, helped by a step over from Evie Priestley that deceived a defender. 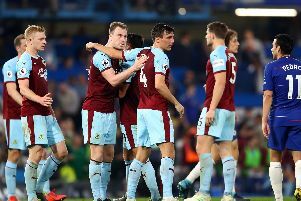 Very soon the Clarets were 3-1 ahead as star player Priestley picked up a loose ball in the 18-yard box and finished well. TSo the Lady Clarets completed a fine season, which gives hope that season 2017 /18 could see a progression up the women’s football pyramid.